Baby steps. 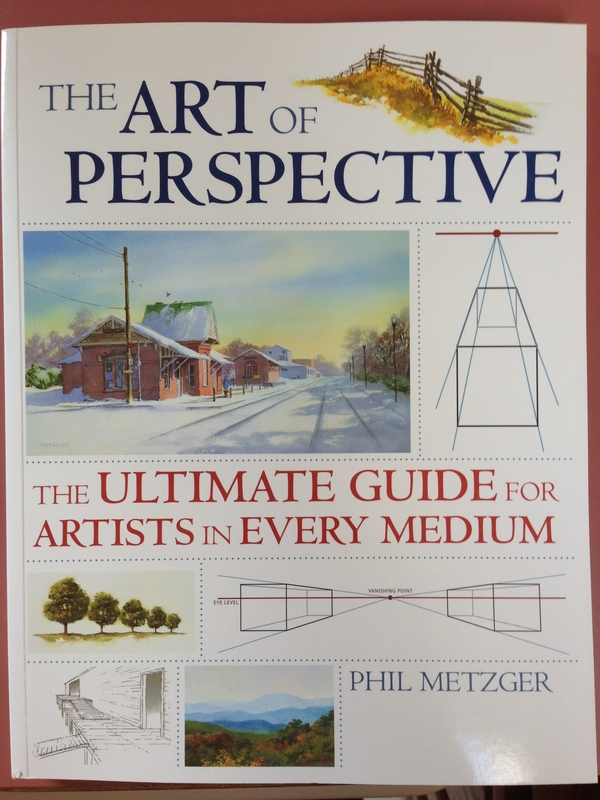 I finally found a great book to try and learn perspective….in full color *insert oohs and aahs here*! Here’s the link on Amazon. This drawing isn’t based on anything I’ve learned from the book, as I’ve only just begun it. I can just tell from a quick flip-through (and all the reviews I read on Amazon) that this is the one. 🙂 I promise a full book review once I finish. Question for those of you into cityscapes, urban sketching, etc….do you use rulers? I think this is the second building I’ve tried to draw, and…it’s pretty crooked. How do artists sketching on location do it?! Especially with the tall steeple…..it was harder to get the whole thing straight than I thought. I did use a straight edge here and there, but I didn’t really use a square or anything to be sure of the angles. The lines on the door definitely would’ve been helped with a ruler. Oh well. Live and learn. I’d love to be painting churches eventually. 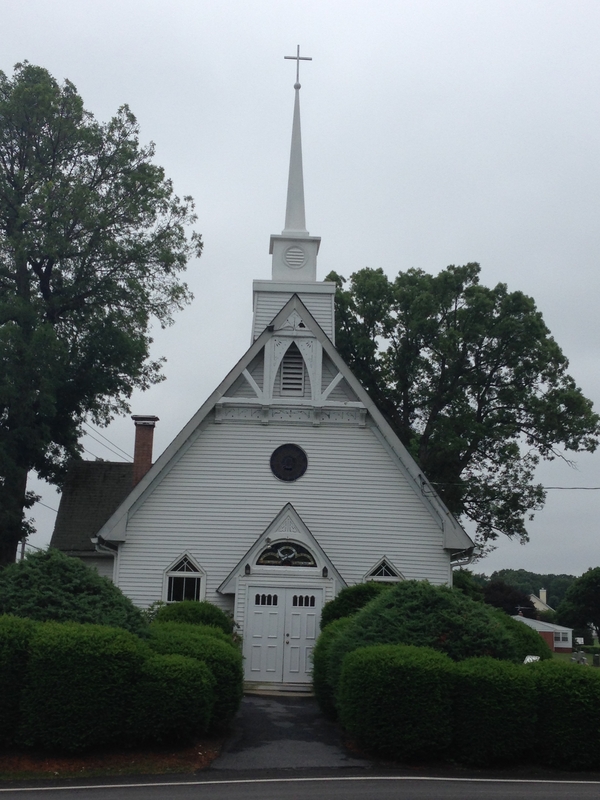 There’s just something about a church…..you can feel the peacefulness, even in the cemetery outside. And barns. Love old churches and barns! Good thing I live in farm country. I hope everyone is enjoying a relaxing Sunday. Remember to let your art supplies come out and play today. I’m pretty sure you’ve earned it. Interesting question. I don’t go for rulers, as I don’t like the feeling of solid rigidity they give to a picture. HOWEVER, I do ‘cheat’ by using the edge of my sketchbook as a guide for my hand to run down if I need a straight horizontal or vertical edge. It’s more ‘natural’ than a ruler, but takes a little bit of practice to hold your pencil still while you pull your hand down. Sadly it doesn’t work for diagonals! Thanks, Rebecca. I really need to dive into that book. I’ve heard a few of your ideas before, and I like that one about the horizontal and vertical edges best, but it does look like it takes practice. Your work with buildings is beautiful, and if I could render them the way you do, I wouldn’t change a thing! I’m amazed you use no tools! Bravo! Look forward to learning more about perspective from your journey ! I like what you’ve done here.I like the color in the front. Part of the charm for me is noticing the hand-drawn bits.You could use a ruler, but the moment you pull it out it feels like you are doing something different: an architectural drawing or a school assignment. But I have used a ruler for some of the beginning lines and it has helped. I also made one of those flattening frames but I’m not sure how useful it has been. Closing one eye seems to achieve the same effect. But I don’t know anything–I’m just a beginner. Your roof line and steeple are great. I like seeing the detail up there. Very nice! Yes–read the book. I think I’ll order it as well. But I would say keep at it. You are doing really well and making images that are intriguing and fun to see. But not tomorrow, because it is “Draw a Bird” day, after all. Kirk, do you wanna lead that this month? I think I got all birded out last time. I’ll join in though if you or someone else wants to lead it. Thanks for your encouragement. 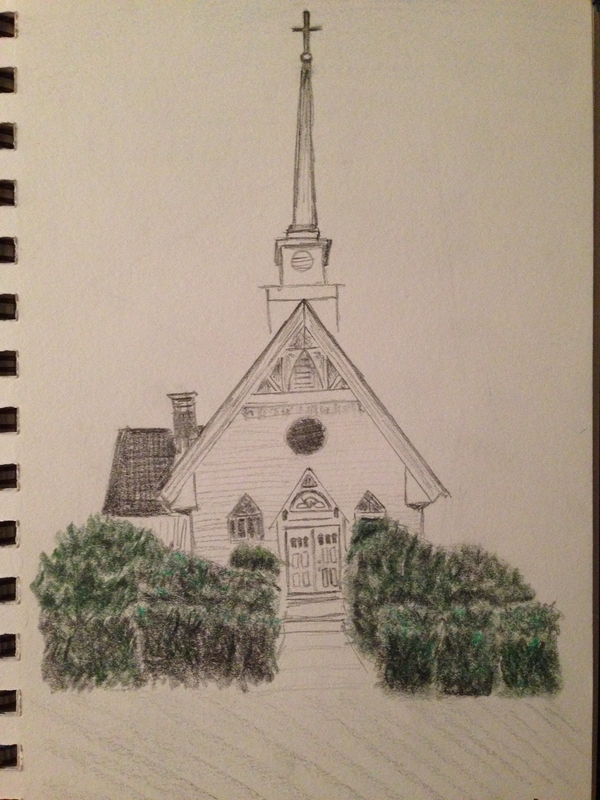 Drawing that house last night was…eye-opening and made me realize how much I need that book! I will be drawing a bird. What’s involved in leading it? Just mentioning it, cheering and encouraging, lol. I don’t use any tools (ha ha can you tell from how wonky my buildings always are?! :)) I feel like as soon as you use a ruler the life and personality is sucked from a drawing. It’s fine for very faint construction lines but if you start drawing the actual finished lines with a ruler then you need to do all of them otherwise the few dead straight lines can stick out like a saw thumb. True, which is what happened with this one. Your buildings look great to me. You’re one of the reasons I wanted to start drawing buildings! Thanks, Nicola. I was just about to ask you how you get the angles right. No tools for that either, you just go with your eye? Ugh that was supposed to be two smilies, no question mark. Thanks, Jane. Great feedback. Good point! I like it without the ruler. I also really like the contrast of the linear church and the dense colored greenery. Very striking. Thanks! I enjoy buildings so hopefully you’ll see more.